Mainship got it right with this 43' Trawler..... A sedan model with GOOD access to the engines...An enjoyable stairwell that leads to a flybridge that rivals MUCH larger yachts, and is capable of doubling the slow speed of a conventional trawler. 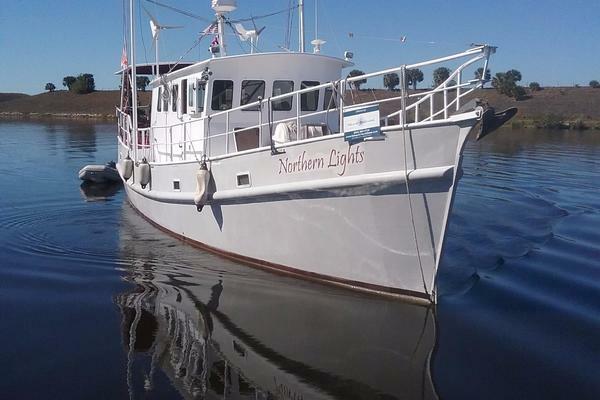 Two Drifters has been maintained at a very high level, and her excellent condition is obvious when you first step aboard. When issues other than general maintenance have surfaced, they were corrected immediately. Records and a maintenance log are in the ships papers onboard. Two Drifters had her 3-Zone A/C unit replaced in 2018, and upgraded to a KVH Trackvision Dome in 2017. Boarding Two Drifters from a floating dock is easy with her large swim platform and transom door. Boarding from a fixed pier, she is equipped with folding steps on either side of the aft cockpit. The aft cockpit is covered and has a storage locker inside the transom. A stairwell leads up to the flybridge, and engine room is also accessed from the aft cockpit. Two Drifters has secure side decks for going forward, and there is a midship door on the starboard side that leads to the lower helm. The entire foredeck has a non-skid surface, and the windlass and forward shore power connection are enclosed in the forepeak. Two Drifters salon is large with a serving counter to port and the lower helm is to starboard. Her galley is down 3 steps from the salon, and is situated midship where the motion of the vessel is least, but the cook is still in touch with guests in the salon. The guest stateroom is to starboard, and has double entry doors. Two Drifters master stateroom is all the way forward. The large head to port can be accessed from Master S/R or from Passageway. Both staterooms and the passageway are carpeted. Two Drifters salon has three access doors, double doors to the aft cockpit and a single helmsman door that accesses the starboard side deck. The salon has a teak and holly sole and has opening side windows with screens & wooden blinds. There are overhead storage cabinets along both sides. A leather sleeper sofa with ottoman and a nice counter/bar are on the portside. To starboard there is a beautiful hi-low table & two chairs. Also the entertainment center with TV/Bose surround sound/DVD/CD and Bluetooth. The electrical AC/DC monitors along with the Shorepower/Gen selector switch and Generator Start Panel are housed just aft of the dinning table. Headroom is 6'8"
Entering through double doors, the Guest Stateroom can also be used as an office. Cedar lined hanging closet with auto lighting Overhead deck hatch with sunshade Portlight Headroom is 6'4"
Very large cedar lined hanging closet with built-in drawers Central-Vac unit Headroom is 6'4" to 6'1"
Two Drifters head is equipped with a Vacuflush toliet, and with a lot of counter space for your stuff and a large sink & mirror, you will think you are on a larger boat. Her tub/shower with a glass door is also a nice touch. The opening portlight keeps the space ventilated. Sporting a custom hardtop with a full enclosure and capable of seating eight adults comfortably, the flybridge of Two Drifters is second to none. Her helm chair along with the two companion chairs make passages enjoyable for captain & crew. And when you include her summer kitchen in the conversation (don't even think of a TV) this is a great 43' boat. Two Drifters engines are the preferred 440 Yanmars with low hours. Her extensive maintenance records show oil changes at 100 hour intervals since 2010.